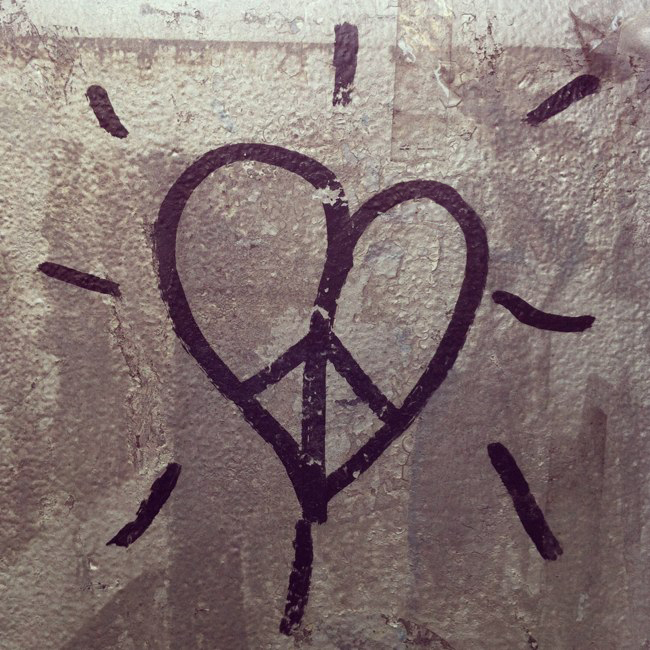 Peace, love, and happiness have a reputation for being touchy-feely hippy values, but aren’t they just basic human values? Shouldn’t we all aspire to find love in our heart for ourselves and each other? Doesn’t every human want peace? And when you come down to what we really want from our lives, isn’t it happiness? At its core, peace is a state of non-violence. When that core is cultivated, peace is a state of harmony. That peaceful harmony is the product of love. Love has many definitions, but at its simplest it is acceptance. It is whatever brings you closer to peace, both within yourself and around you. Loving yourself translates to respecting yourself. It means that you’re not willing to lie, cheat, steal, hurt others, or misrepresent yourself in any way. When you can be true to yourself and accept yourself the way you are, you get to a state of inner peace. Inner peace doesn’t mean that you are complacent and don’t push yourself to be better at the things you want to do. Rather it creates the conditions from which your heart can best operate. It removes the friction between you and what you want to do and when you follow your heart you’re more likely to be happy. Doing what you love can be challenging. Often it requires you to let go of fear. Transcending your self-imposed limitations can be very uncomfortable. It is through being willing to experience that discomfort – through being devoted to your heart – that you can rise to meet your full potential. Being human isn’t easy. You can embrace your humanity by making the effort to be true to yourself and recognizing how hard it can be for others to do the same. We are all human. We all struggle to find our way to be happy in this world. Acknowledging this is the seed of external peace. When that seed is planted you see the benefit in serving those around you. You come to inner peace by loving and accepting yourself. You find happiness by being true to yourself and following your heart. Finally, you create peace around you by serving others and helping them do the same. Serving others doesn’t necessarily mean doing charity work and volunteering. It means serving the moment. Every time you engage with another human being, ask yourself – how can I serve this person? So often we think – what can I get out of this situation? Inevitably we create a path to stress and frustration. When you ask, what can I give to this situation, you create a path to mutual gain and peace. Undoubtedly, modern life can feel more like survival of the fittest than peace, love, and happiness. Ultimately though, you create the world you want to live in. You decide what is important to you and the attitude you bring to every moment. It isn’t about big decisions or completely changing your life, it’s about putting thought into all the little things that you do every day. You have the power to be the change you want to see in the world. It all starts with you. I’llbookmark your blog and check once more here frequently.